For a moment after opening the bag, I thought, "Oh, bummer! There's no resealable ziplock on this package." A moment later, I realized why. These things won't last long enough to get stale. Oh, and that whole "4 servings per container" there on the nutrition info IS A BIG FAT LIE. You'll be lucky to get two servings here. Especially if there's more than one person involved. Not just because two people eat twice as much, but because eating the bag becomes a race against the other person. If you snooze, you'll lose your share. 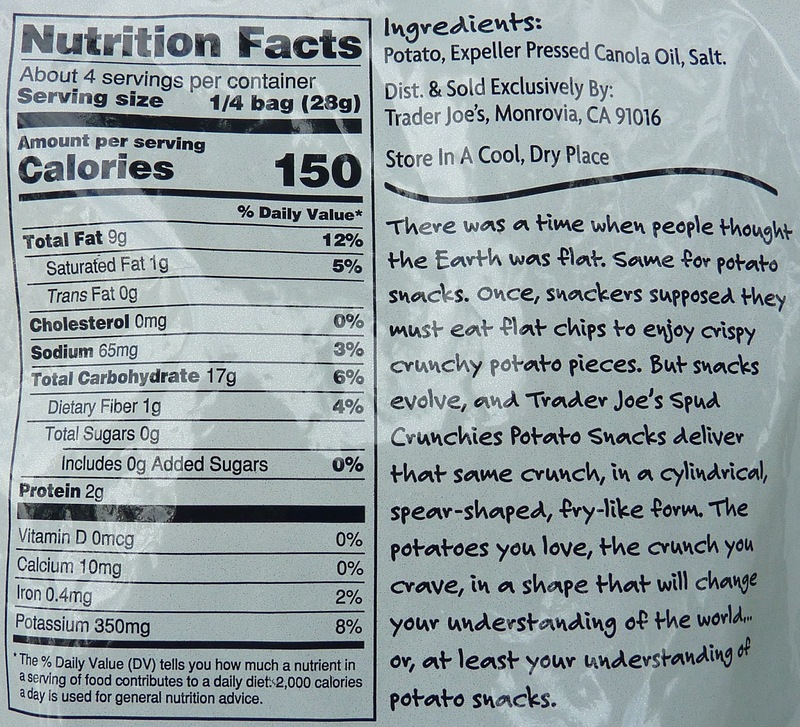 And I should mention that the picture right below this paragraph was taken near the end of the bag. I had opened the package with every intention of taking a picture right out of the gate, but we actually plowed through nearly the whole thing before we remembered we hadn't taken a picture. As a result, the crunchies you see here aren't perfectly representative of the ones in the bag—they're somewhat smaller than the average sticks you actually get. 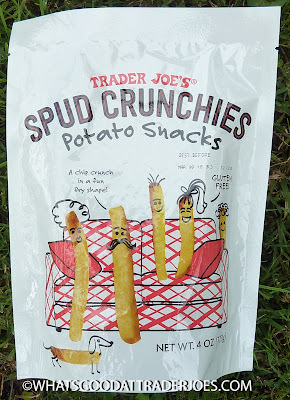 A long time ago, there was a mini-discussion about another TJ's product that emulated "zombified McDonald's French fries," Trader Joe's Veggie Sticks. 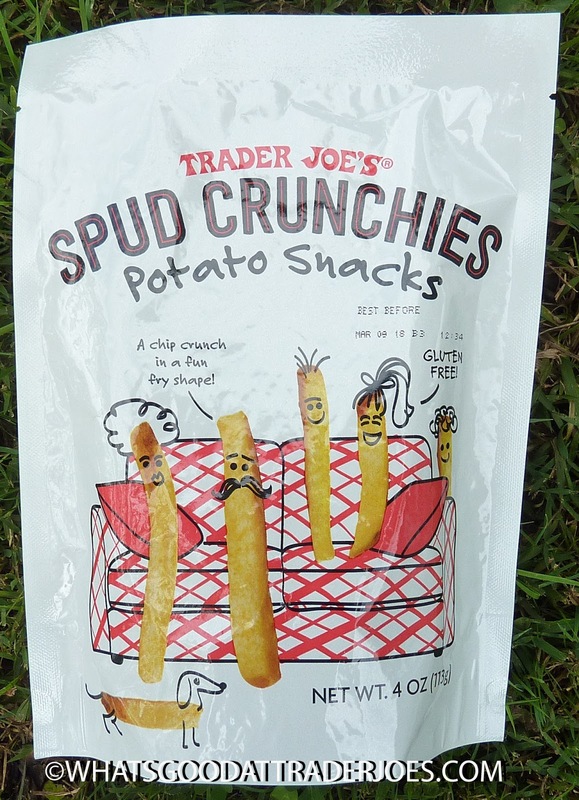 We were a fan of those snacks, but somehow, by some miracle of science, Trader Joe's got their hands on an even better product. There are significantly fewer ingredients here. These snacks feel even more potato-y because they're not made of potato flour, wheat flour, and other weird vegetable "powders." These delightful, snacktastic sons of mothers are made with "potato," and in my opinion, they even more accurately approximate an age-old McDonald's fry, but miraculously, they do it with more flavor. They're quite salty, which totally works here. 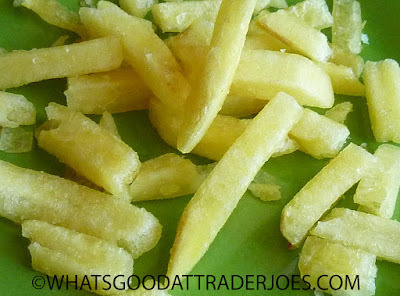 As mentioned before, they're also very potato-y, and you can taste and feel the canola oil as well. Texture-wise they're definitely similar to an ancient fry, but ever so slightly in the direction of a potato chip. They're less starchy than long-forgotten fast food fries, and perhaps slightly more crispy. This is just a fun, tasty snack all around. Would make a great after-hike treat. Two bucks at the local Joe's. I'd buy 'em again. A few years ago, Costco was carrying a similar product but but in HUGE bags. They were absolutely addictive and I'm not even a "salty snack" person. I saw these during my last T Joe's run and I didn't pick them up because I knew they wouldn't even last the car ride home...better to not even start, right? TJ's Mochi Bites are also good and have similar ingredients. Love them over the MSG-laden snacks we find at most of our Asian grocery stores. Yeah we like those too! UGH!!! I did NOT need to know about how good these are!! I just barely talked myself out of buying them on my last visit .... i live alone and suspected they wouldn't last 24hrs if they are as tasty as you say they are. Hmm. I certainly can't unlearn this but maybe i'll buy them to bring to work and share to avoid hard time at the gym repenting...! Ooh! Yeah that might be TJ's supplier for these. If only TJs carried the actual korean Calbee honey butter chips and not the sad version they put in stores...! The Calbee version should be a controlled substance. 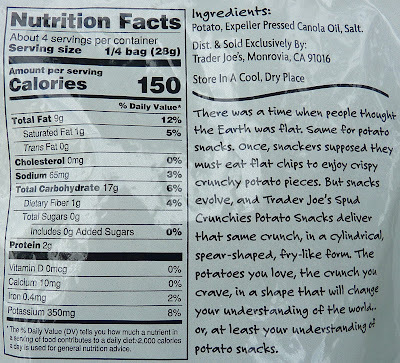 Surprised to hear salty in the review since the nutrition label indicates rather low sodium, but maybe not accurate. I'm willing to try to see if my willpower can make it last 2 servings. Sounds good. Good point. They're not, like, ridiculously salty. But when there's only 3 ingredients, I guess the salt flavor shines through pretty easily.